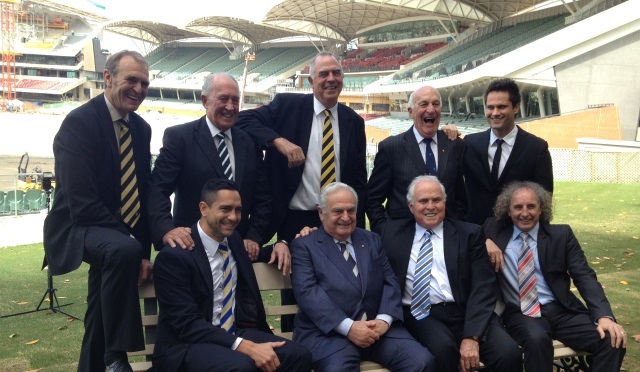 The names of some of South Australia’s greatest football names – including Cahill, Kerley, Davies, Ricciuto and Wanganeen – will take pride of place at the Adelaide Oval from 2014. They will join those already to be honoured with statues at the ground – Malcolm Blight, Russell Ebert, Ken Farmer and Barrie Robran – with their names to feature prominently throughout the stadium. Peter Carey (Glenelg premiership player and games record holder, Australian Football Hall of Fame inductee) – The Peter Carey Bar in the Southern Stand. John Halbert (Sturt premiership captain and coach, Magarey Medallist). John Platten (Magarey Medallist, Brownlow Medallist, four-time Hawthorn premiership player, Australian Football Hall of Fame inductee) . The John Halbert Room will be located in the Eastern Stand; The John Platten Bar will be located within The John Halbert Room. Leigh Whicker (Sturt player, SANFL Executive Commissioner, SANFL and AFL Life Member) – The Leigh Whicker League Room (Southern Stand). Garry McIntosh (Norwood premiership player, captain and games record holder, dual Magarey Medallist) – The Garry McIntosh Bar will be located on the ground level of the Eastern Stand. It is hoped that South Adelaide legend and Australian Football Hall of Fame inductee Dan Moriarty will also be recognised at the Adelaide Oval with a display to honour his feat of being the only player to win three consecutive Magarey Medals. South Australian Football Commission Chairman John Olsen said the process of choosing the legends to be honoured had been long and exhaustive. “Football in South Australia has had so many great players over our 136-year history that it was always going to be an incredibly difficult process to narrow it down to a select few,” Mr Olsen said. Mr Olsen said the way remained open for other greats to be honoured in the future.